Want to know how to use an electronic component? This second book of a three-volume set includes key information on electronics parts for your projects - complete with photographs, schematics, and diagrams. You'll learn what each one does, how it works, why it's useful, and what variants exist. Want to know how to use an electronic component? This second book of a three-volume set includes key information on electronics parts for your projects--complete with photographs, schematics, and diagrams. You'll learn what each one does, how it works, why it's useful, and what variants exist. No matter how much you know about electronics, you'll find fascinating details you've never come across before. Perfect for teachers, hobbyists, engineers, and students of all ages, this reference puts reliable, fact-checked information right at your fingertips--whether you're refreshing your memory or exploring a component for the first time. Beginners will quickly grasp important concepts, and more experienced users will find the specific details their projects require. 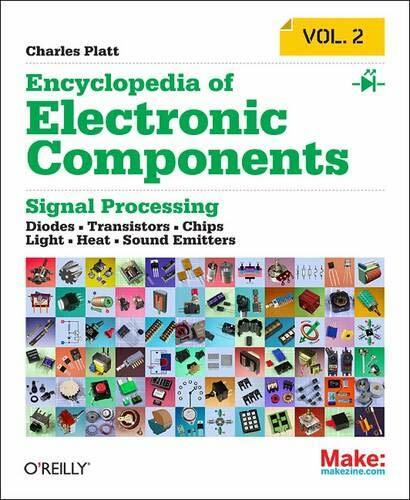 Volume 2 covers signal processing, including LEDs, LCDs, audio, thyristors, digital logic, and amplification.Unique: the first and only encyclopedia set on electronic components, distilled into three separate volumes Incredibly detailed: includes information distilled from hundreds of sources Easy to browse: parts are clearly organized by component type Authoritative: fact-checked by expert advisors to ensure that the information is both current and accurate Reliable: a more consistent source of information than online sources, product datasheets, and manufacturer's tutorials Instructive: each component description provides details about substitutions, common problems, and workarounds Comprehensive: Volume 1 covers power, electromagnetism, and discrete semiconductors; Volume 2 includes LEDs, LCDs, audio, thyristors, digital logic, and amplification; Volume 3 covers a range of sensing devices.